A typical recruiter will spend roughly six seconds scanning your resume to decide whether it's worth reading. How many times have you wished you could get inside the recruiter's head and deliver just the kind of resume they're after? You're not alone in wondering how to craft a successful job application that predicts and addresses the expectations of recruiters. Here's some good news: if there's one thing all recruiters search for, it's relevant professional skills. Include these skills in your resume and cover letter, and you can be sure that your application matches the job posting and grabs recruiters' attention within these six critical seconds. Knowing how to make a perfectly tailored resume will boost your chances at landing your dream job. Here are 6 essential tips to help you tailor your resume to the job description and make your application more effective. Your first step is to examine the job posting you're targeting. Highlight all required skills and experience. These are skills you need to do the job. Most skills you see in the job description will fall under this category – recruiters don't like to waste their time. Example: Developing a strong brand. These are skills you can use in different roles and industries. Some of these skills usually make it to the job posting too. Example: Fluent writing competency in Spanish. These skills help you to survive in everyday life and engage in human interactions. Now that you've got all these skills highlighted, it's time to make good use of them. Take a second look at your job-related skills and screen yourself. If you don't have these skills, you won't be able to do this job – save yourself time and look for other opportunities instead. If you've got these core competencies, make sure to place them in the top third of your resume, so they're instantly visible to recruiters. Consider transferable skills as well. You don't need them to do this job, but recruiters like to see them on resumes. That's why it's smart to include these skills throughout your experience section. What about adaptive skills? Use them as adjectives when describing yourself as a professional. “Hardworking” or “precise” are good examples that make you even more attractive in the eyes of recruiters. Equipped with the most valuable skills, you need to ensure that they instantly grab the attention of recruiters. This is where numbers and details come in. Don't be afraid to brag and get specific about your skills. Show recruiters how you used them in your past jobs to highlight your professional achievements and demonstrate that you're the right match. “Increased satisfaction by 15% through efficient customer service.” It sounds way better, don't you agree? Thanks to these details, recruiters will be able to imagine you achieving similar results in the position for which they're recruiting. Nothing grabs recruiters' attention like a short, snappy introduction that emphasizes your skills set and career progress. It works like a sales pitch that you can use when someone asks you to tell them more about yourself. Your resume summary is where you can make the most out of your keywords skills and develop a resume that is perfectly tailored to the job offer. If you're transitioning from one career track into another, you can still use these keywords when writing a resume objective. Follow your tailored resume with an optimized cover letter. Recruiters will scan it with essential keyword skills in mind. When discussing your experience and expertise, stick to the same keywords you defined for your resume. Expand upon points you kept brief in your resume and optimize your cover letter with consistent keyword usage. Show how your skills and competencies will help employers solve specific problems. That's how you gain an advantage over other candidates. To find out whether you tailored your resume to the job description, just drop it into a cloud generator. You'll see keywords and phrases that are most prominent in your resume. 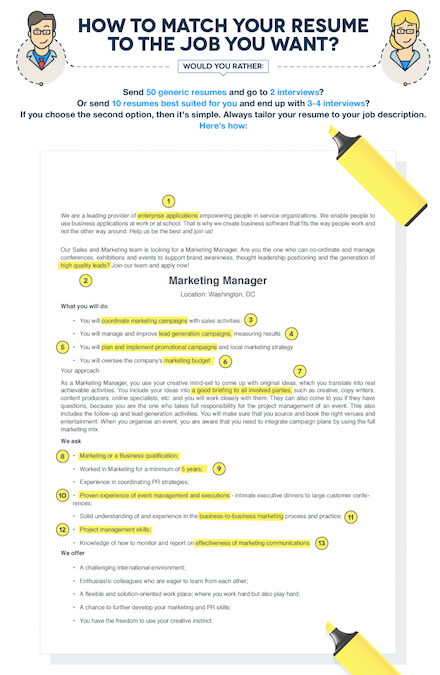 If these aren't related to the skill-related keywords you listed at the beginning, have a second look at your resume and rewrite some of the sections to include relevant keywords throughout the document. Tailoring your resume to match the job posting is a recipe for success. This is how you can show recruiters that you care about the offer and know how to present yourself as a great fit for the job. If you take your time tailoring your resume to job postings that interest you, you'll be rewarded with more invitations to job interviews than you’d expect. 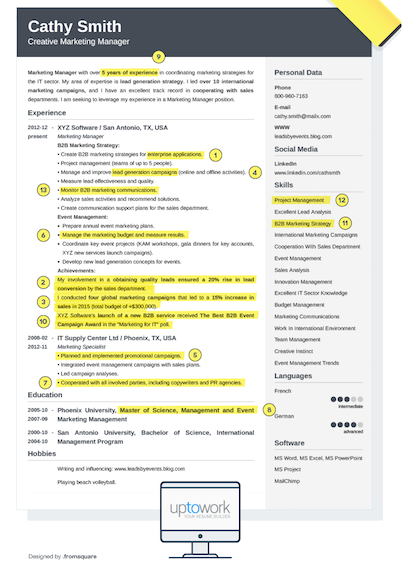 Natalie is a writer at Zety - Your Resume Builder. She writes about how to create successful resumes so that you can land your dream job. When she isn't writing, she eats tacos and reads complicated novels.